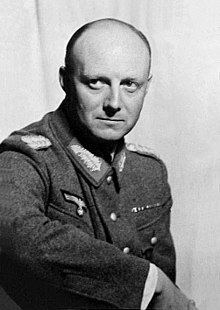 Henning Hermann Robert Karl von Tresckow (January 10, 1901 – July 21, 1944) was a Major General in the German Wehrmacht who helped organize German resistance against Hitler. He attempted to assassinate Hitler on 13 March 1943 and drafted the Valkyrie plan for a coup against the Nazi regime. He was described by the Gestapo as the "prime mover" and the "evil spirit" behind the July 20 plot to assassinate Hitler. Robert Kane, Disobedience and Conspiracy in the German Army, 1918-1945, p. 163. 1943, at his sons' confirmation at Potsdam Garrison Church. Michael Balfour, Withstanding Hitler, 1988, p. 130. I would like to show the German people a film with the title "Germany at the end of the war". Then perhaps people would be alarmed and would realize where we are heading. People would agree with me that the superior warlord (Hitler) must disappear. But since we cannot show this movie people will create the legend of the "stab in the back" whenever we will act against Hitler. December 1941. Bodo Scheurig, Henning von Tresckow, ein Preusse gegen Hitler, p. 135-6. Philipp von Boeselager, Daily Telegraph book review of Valkyrie: the Plot to Kill Hitler by Philipp von Boeselager , February 5, 2008. 1942. Henning von Tresckow 10.01.1901 – 21.07.1944 von Dr. Hans-Peter Diller, OTA. This page was last edited on 24 September 2018, at 19:56.